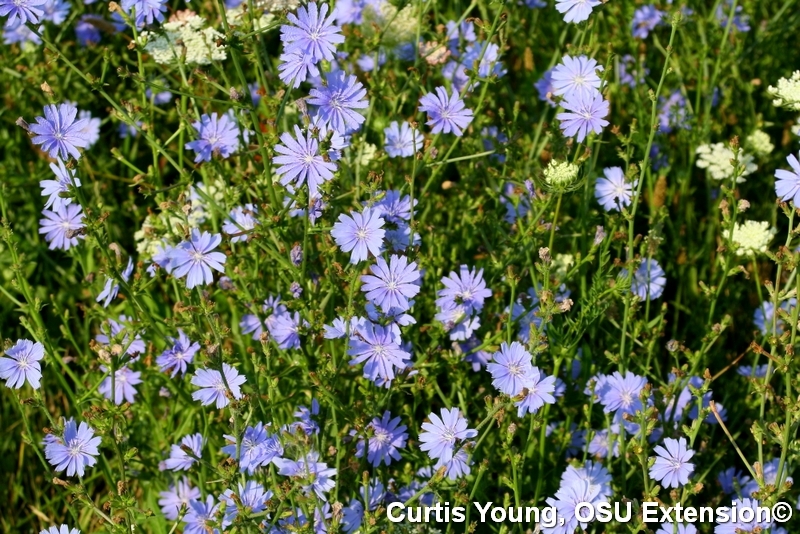 Chicory is a weed that is in bloom in Ohio right now. It can be seen growing abundantly beside roads and highways. It can also be found in lawns, pastures, fields, and waste places. Originating in the Mediterranean chicory was distributed throughout much of the world where it was grown for centuries as a salad green. It escaped from cultivation in North America and has naturalized and spread throughout southern Canada and the U.S.
Chicory initially grows as a rosette of irregularly-toothed basal leaves and then later produces round, hollow and nearly leafless stems scattered with blue daisy-like flowers along their length. The plants produce a thick, strong taproot containing a bitter and milky sap. Chicory is propagated by seed; the average plant produces about 3000 seeds. Chicory blooming mixed with wild carrot by the roadside.